Originally made by the William Fuld company, today Hasbro sells the Ouija Board as a game complete with written rules. 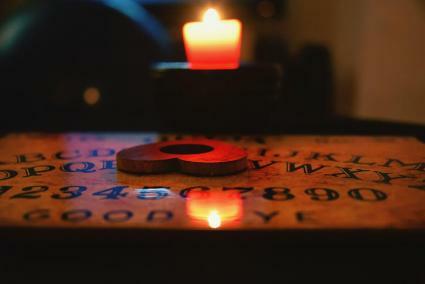 Many people, however, use the Ouija board as more than a game, using it for an oracle or to communicate with spirits. So while you can play by Hasbro's Ouija board rules, there are many guidelines you can also follow to get the most out of your Ouija board. Set the board either on the players' laps or on a table between two players. If there are additional players, they can take notes and act as scribes. Put the planchette on the wooden board (letter side up) in the center. Both players place fingertips lightly on the planchette. Take turns asking questions, but everyone needs to agree and focus on the question. Speak slowly and clearly. Wait for the Ouija board to answer. There is a lot of fear surrounding the use of a Ouija board. 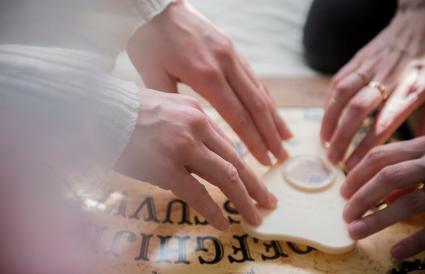 Many people have shared Ouija stories of both positive and negative encounters, and movies like The Exorcist, while fictional, have added to the board's mystique. Likewise, urban legends have also led to fear of and encounters with Ouija board entities such as Zozo, who author and Ouija board expert Karen A. Dahlman suggests is most likely a legend generated by fear. Still, it doesn't hurt to be cautious. Many of the unwritten Ouija board rules are in place to help the session stay safe and productive. 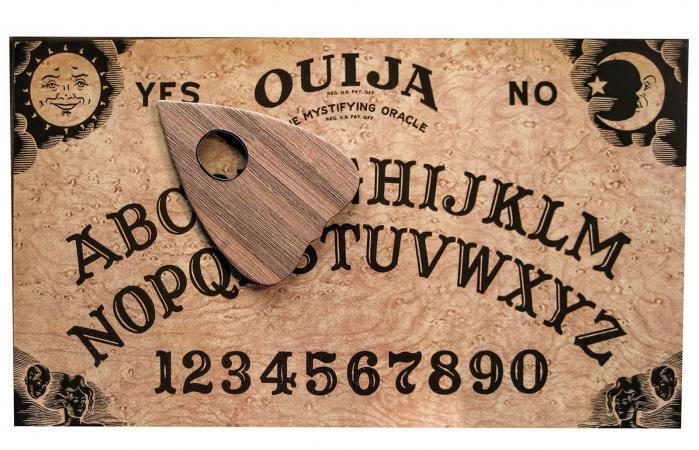 Like electronic voice phenomena or a pendulum, the Ouija board is a tool used to communicate with spirits. When you initiate spirit communication, always take it seriously because you never know who you might contact. Enter into a Ouija board session mindfully, much like you would if you were about to conduct a seance. Don't mix your spirits. Everyone should be sober; don't use the Ouija board at a party with alcohol or drugs, and don't use it as a lark or in a joking manner. No matter how many people are in the room, assign one person as the official "questioner." This way, any spirits connecting through the Ouija board know when to answer, since sometimes sessions with a lot of people can get chaotic with everyone suggesting questions to ask. The questioner should be one of the two people with their fingertips on the planchette. Ironically, although the Ouija board is sold as a game, it's not a game for children. Err on the side of caution and don't involve children in Ouija board sessions. Enter the dialog with a manner of respect. Don't demand spirits answer you, taunt, or make disparaging statements. Treat any spirits you encounter with kindness and respect. Many people also feel provoking may cause angry spirit reactions or put you in touch with a negative entity. It's important to break the energy with any spirit you contact by closing every Ouija session. Even if you don't think you have contacted a spirit or entity, it's important to close the session to dispel any energy you have built up. To do this, thank the spirit for communicating, let them know you are done, and then slide the planchette to "Good-bye." Turn the planchette and/or board upside down and then put it away. People touching the planchette during the session may also wish to touch the earth to ground themselves or run their hands under cold water to break any energetic connection. Always put the board away. Never leave a planchette sitting on a Ouija board and walk away because this leaves the energetic connection open. Occult specialist and Ouija board expert Montana Jordan points out, "The board is an extension of you and your own parapsychological capabilities. The board itself is not good nor evil. The goodness or evilness lies within the intention of the user. Like any power item, i.e., a wizard's wand, a Catholic's Eucharist or an oracle's crystal ball, the board is a tool. The power lies in the energy that is being directed into the board (you). A positive intention sets the scene for a positive result." Therefore she recommends you set a positive intention before a session. Additionally, a few guidelines can help optimize its use. Place your fingers only very lightly on the planchette. Use only the tips of the middle and index fingers of each hand. You should easily be able to slip a piece of paper or shine a light between your fingertips and the planchette. This can help eliminate the ideomotor effect or the other person intentionally moving the planchette. If you're afraid (or have any other negative emotion at the time), don't play. Fear can cause all sorts of unintended responses and consequences. Always be in a peaceful and positive frame of mind before using the board. Be patient and don't get discouraged. Sometimes it takes a while to connect or for any entities to begin moving the planchette. The planchette may move very slowly sometimes, which is fine. If this is the case, make sure you have a third person acting as a scribe to record the letters as they arise. According to Jordan, her top guideline for using the Ouija board, "The board is not any more dangerous than any other piece of paranormal investigative equipment. It is a communication device that can be utilized in two ways: A) as a paranormal communicative device that allows contact with external stimuli, i.e., ghost/spirit/ET and/or B) as a parapsychological communicative device that allows more intimate contact with yourself/psyche/subconscious/inner consciousness." She suggests users keep this in mind as they work with a Ouija board. A Ouija board is one tool many people use to communicate with spirits. By following some guidelines and basic safety rules of the Ouija board, you can make the most of your session, and you may even gain some valuable information.